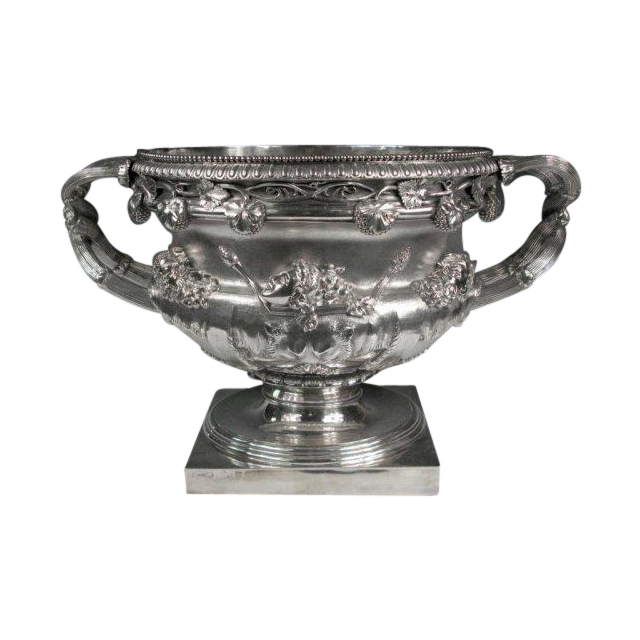 An Exceptional Quality, Rare & Massive, Sterling Silver Warwick Vase Wine Cooler. George III Dated 1818, Made By Solomon Royes & John East Dix In London, England. 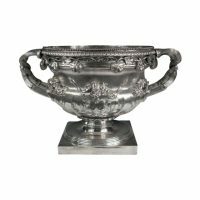 The Detail Is Exceptional, Probably The Best You Could Find, And One Of The Earliest & Largest Examples In Sterling Silver. The Original Warwick Vase, An Ancient Roman Marble Vase With Bacchic Ornament, Was Discovered In Pieces, Near Rome At Hadrian's Villa At Tivoli About 1771 by Gavin Hamilton, A Scottish Painter, Antiquarian And Art Dealer. He Sold The Fragments To Sir William Hamilton, British Envoy At The Court Of Naples, Who Had It Repaired & Restored. It Then Passed To His Nephew George Greville, 2nd Earl of Warwick, Who Brought It Back To Warwick Castle Where It Caused A Sensation. At First It Sat On The Lawn At The Castle, But Later Was Moved Into A Greenhouse To Preserve It From The Weather. 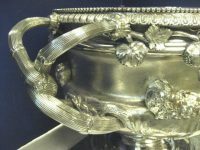 The Vase Was Widely Admired And Much Visited In The Earl's Greenhouse, But He Permitted No Copies To Be Made, Until 1808, When Molds Were Made At The Special Request Of Lord Lonsdale, Who Intended To Have A Full Size Replica Cast In Silver. The Sculptor William Theed The Elder, Who Was Working For The Royal Silversmiths Rundell, Bridge & Rundell, Was Put In Charge Of The Arrangements, But Lord Lonsdale Changed His Mind, And The Project Was Aborted. 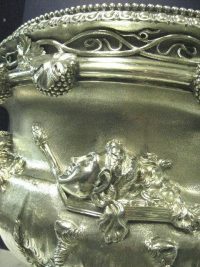 The Rich Ornament, And The Form, Which Is Echoed In Sixteenth Century Mannerist Vases, Combined To Give The Warwick Vase Great Appeal To The Nineteenth Century Eye: Numerous Examples In Silver And Bronze Were Made, And Porcelain Versions By Rockingham and Worcester. Theed's Moulds Were Sent To Paris, Where Two Full Size Bronze Replicas Were Cast, One Now In Windsor Castle, The Other In The Fitzwilliam Museum, Cambridge. 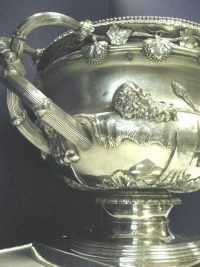 It Was Also The Model For The Silver Gilt Tennis Trophy, The Norman Brookes Challenge Cup Won At The Australian Open. The Vase Has Two Large Handles Formed Of Interwoven Vine Branches, From Which The Tendrils, Leaves, And Clustering Grapes Spread Around The Upper Margin And Features Classical Bacchanal Masks And Associated Emblems, Such As A Pine Cone Tip Staff Known As A Thyrsus. Enfolding The Middle Of The Body Is The Skin Of A Panther, With Head And Claws. Above Are Heads, All Representing Satyrs, Except One, Which Is That Of A Female, Traditionally Said To Have Been Substituted For A Missing Head And Made By An Italian Carver In The 18th century Into The Likeness Of Lady Hamilton; However, As The Result Of A Supposed Quarrel With Her, The Carver Gave Lady Hamilton's Head A Fawn's Ear. The Vase Stands On A Square Pedestal Foot. Weighs Approx. 425 Troy Oz = 13,220 Grams, Well Over 29 Pounds. 15.25"High x 22" Wide x 16" Deep.